PLEASE NOTE - This set now contains 4 bonus dvds containing The Hurricane Express ans Shadow of the Eagle Serials making this a 24 DVD 44 film set. The 20 best John Wayne classic movies on DVD, and 2 complete serials make this this best value set around. Titles include: The Dawn Rider, The Desert Trail, The Lucky Texan, Neath Arizona Skies, Rainbow Valley, The Trail Beyond, Texas Terror, The Star Packer, Paradise Canyon, Riders Of Destiny, West Of The Divide, Winds Of The Wasteland, Hell Town, The Lawless Frontier, The Man From Utah, Randy Rides Alone, Blue Steel, Sagebrush Trail, Angel And The Badman, McLintock. Now with all 12 episodes of the Hurricane Express and Shadow of the Eagle serials on 4 bonus dvds to make this a 24 dvd set. 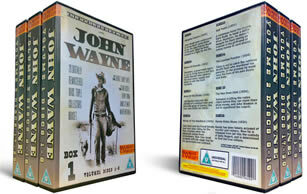 We have a limited number of these John Wayne DVD sets left so buy now to make sure you get one. 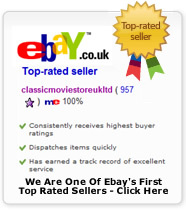 We also have other western sets for sale, take a look at our western section.